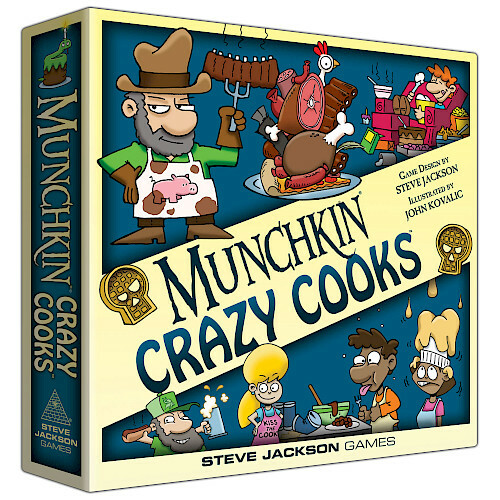 Daily Illuminator: Crazy Cooks And Other Munchkin Games: A New Recipe For Fun! September 18, 2018: Crazy Cooks And Other Munchkin Games: A New Recipe For Fun! Munchkin Crazy Cooks is a fine game on its own, but sometimes you really want a combo plate of Munchkin fun. Mashing up isn't just for potatoes! Here are a few suggestions for combining Crazy Cooks with other games to make a filling, low-calorie gaming meal. Munchkin Spell Skool: You can call this one "Secrets of the Spell Skool Cafeteria." This is likely to be a silly game, with students joining clubs (Spell Skool Classes) and then getting kitchen duty (Crazy Cooks Classes) instead of their club activities. Or maybe they blow off the kitchen for a club meeting. Maybe some of the monsters they learn about in class turn out to be the main course in that night's supper . . .
Munchkin Cthulhu: The possibilities of Recipes That Man Was Not Meant To Know makes this a game I want to try. And having TWO extra win conditions in the game means your opponents have to keep an even closer eye on what you're doing, which makes it more likely they'll miss the things you don't want them to see. Regardless of what you mix Munchkin Crazy Cooks with, make sure you remember the combination-game rules about the Food Tokens. Don't miss out on an easy victory because you weren't paying attention! And if you have a really good story, share it on our forums or the Munchkin Facebook page!